The quarterly meeting of the Del Cerro Action Council (DCAC) was held on Thursday, Jan. 24 at Temple Emanu-El. John Steffen, our police community relations officer for the city of San Diego, reported crime incidents continue to remain very low in our community. He also reported staffing for Eastern Division is up from 50 percent to 70 percent in the last three months. There are 80 cadets in the current police academy. Corporal Peterson, the police community resource officer for SDSU, reported there was a 70 percent reduction in calls to Adobe Falls in the last four months compared to the same period last year. Roarke Shanley, the new community outreach representative for Councilmember Scott Sherman, reported Block 7U is the next area in Del Cerro to be undergrounded. Notices will be sent to all residents in Block 7U announcing public meetings about the undergrounding project. The area is north of Del Cerro Boulevard, east of College Avenue and goes up to the top of Del Cerro. The estimated start date is 2020. For a map of the undergrounding projects, go to sandiego.gov. Type “Undergrounding Info Map” in the search box. Rachel Gregg, director of government and community relations for SDSU, announced scoping meetings regarding SDSU West were being held in January. This is a general review of the project and the impacts it may have on the community. For more information, check the website at sdsu.edu/missionvalley or send an email to mvcomment@sdsu.edu. SDSU is working on the environmental impact report (EIR) for the project. The California State University Board of Trustees is planning to vote on the EIR by January 2020. The first two projects on the site will be the stadium and the park areas. Dr. de la Torre is scheduling a tour of Adobe Falls with Dr. Eric Frost within in the next month. Pastor Robert Herber announced his staff will be conducting an initial cleanup of the site in the next couple of weeks. Kathi Riser with The Atlantic Group, which is the church land use planning consultants, stated plans have not been submitted to the city for the site as of now, but the initiation of the community plan has been approved. The capacity of the church is set to accommodate 900 people. She also mentioned they are working with the planning and traffic engineering departments regarding a possible traffic signal about half way down College Avenue. SDSU is looking at the whole area which includes their property east of College Avenue all the way down through Grantville. The existing cement culvert would never be built today. A firm is doing research on the falls. During a recent rainstorm, there was a lake east of College Avenue because of the backup where the water goes underneath the freeway from SDSU. The gate Caltrans installed on the SDSU side of the tunnel was washed away. Currently there is no gate and Caltrans is working on plan B. Mark Alan, chair of the Refurbishing the Princess Del Cerro Park Committee with the Friends of Del Cerro, announced a cleanup project is set for Saturday, Feb. 16 from 9 a.m. to noon. The committee is working with city staff to ensure the project is complying with all city regulations and policies. The initial project will refurbish the playground. Three student groups affiliated with the Grantville-Allied Gardens Kiwanis Club have already signed on; Lewis Middle School Builders Club, Patrick Henry Key Club and the SDSU Circle K.
$3,500 earmarked for the playground by the Del Cerro Action Council is being used to launch the refurbishing of the park. If you are interested in helping, email us at PDCPark@cox.net. All proposed MADs in the city of San Diego are on hold pending a lawsuit in La Jolla. The case was filed by residents who felt some of the items in the proposed MAD were the responsibility of the city of San Diego. In January, the case was dismissed because the initial petitioner against the MAD had no direct ties to La Jolla. A new lawsuit will most likely be filed. A resident made the comment that according to the ordinance, the City Council can vote to change the assessment by a vote of the City Council and not a vote of the residents. As a follow, I called Paul Sirois, a deputy director of the Park and Recreation Department. He said most MADs have a built in consumer price index (CPI) clause that allows the assessment to increase no more than the California CPI, which has recently been between 2 and 3 percent. The City Council cannot arbitrarily raise the rates. Several months ago, the “No U-Turn” sign facing west on Del Cerro Boulevard at Marne Avenue was hit and removed. The city was asked to replace the sign that indicated a “No U-Turn” for eastbound traffic. The sign was installed, but for westbound traffic. The city was notified and indicated the sign would be reversed by the end of February. The property manager was contacted and asked if they would consider designating a specific pedestrian pathway from Madra Avenue and Del Cerro Boulevard into the parking lot. We have not received a response to date. The next meeting of the DCAC will be at 7:30 p.m. on April 25 at Temple Emanu-El. —Jay Wilson is secretary of the Del Cerro Action Council. 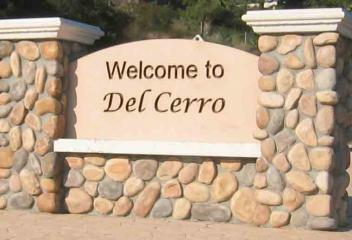 Visit delcerroactioncouncil.org.